Client account management. Manage all aspects of customer relations through a user-friendly control panel, running in MS-Access (part of Microsoft's Office suite.) Your clients can edit portions of their own listings through secure website forms. Bills are paid securely online. Optional function allows client financial data to be exported from QuickBooks accounting software to client's secure online admin page. 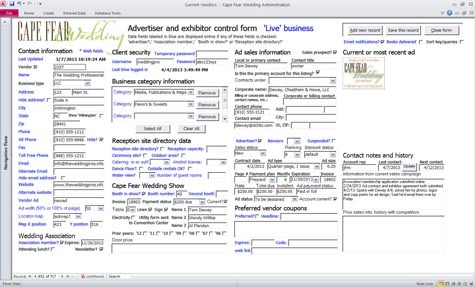 These examples are from a wedding planning site, which puts advertisers and bridal-show exhibitors online, as well as capturing registration data from users. The underlying technology can easily be adapted for the needs of a wide range of internet businesses. The control panel, shown at right, is a custom-designed form in MS-Access. The Access database files, kept on the company's in-house computer, are securely linked to a robust SQL Server database. Housed on a web host's server, that "back end" drives all the website's interactive features. This easy-to-use interface easily lets a non-specialist user instanteneously update a client's online listing. Changes that are visible to the public include activating or removing a directory listing, changing an ad's size or expiration date, and adding or dropping a business category. Other updates, which affect only the client's own secure interface, include such details as contract renewal deadlines, payment status, and links to secure contract forms. to example of MS-Access control panel form. Clients, in turn, can update their own data through a secure Administration Page, which runs in any web browser. Changes to such details as phone numbers or email addresses, made on password-protected forms, are immediately written into the master database. The site owner can easily track these changes; the owner is notified by an automated whenever a client logs in. to Admin page, which gives clients links to account management tools. to Client's listing edit page, which instantly updates master record. to Business category form, which adds or drops categories with a click. Manage large, complex websites with easy form. This MS-Access form is used to manage a client's website listing. Click to see a full-scale version. There's no limit to the sorts of data fields that can be incorporated, to customize this interface for any business' unique needs. Make your clientele feel at home on your website with their own easy-to-use forms. Accessible with a username and password, in any web browser.